2. 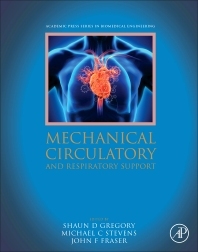 Optimizing the Patient and Timing of the Introduction of Mechanical Circulatory and Extracorporeal Respiratory Support. Shaun D. Gregory has Bachelor, Masters and PhD degrees in medical engineering and has completed research in some of the world’s leading cardiovascular device research institutes. He has multiple research publications, grants, patents and awards. Shaun is a research fellow in the Griffith University School of Engineering and directs the Innovative Cardiovascular Engineering and Technology Laboratory, a world-class research facility with a team of biomedical, mechanical and electrical engineers who work alongside clinicians to develop devices to support the heart and lungs. Michael C. Stevens has bachelor and PhD degrees in biomedical engineering and has a special research interest in control of mechanical devices that support the heart. He has worked in cardiovascular research institutes in Australia and in the United States and is now employed by the Graduate School of Biomedical Engineering at the University of New South Wales, the largest biomedical engineering school in the southern hemisphere. John F. Fraser (MBChB PhD FRCP FRCA FFARCSI FCICM) is the director of the Critical Care Research Group, The Prince Charles Hospital; Director of ICU, St Andrews War Memorial Hospital; Professor of Critical Care and Anesthesia University of Queensland. He established seven purpose-built research laboratories at TPCH, has published over 300 peer reviewed papers and multiple book chapters, and delivered over 150 keynote and invited lectures nationally and internationally. He was the cofounder of BiVACOR Pty Ltd, and leads the 1st International Centre of Research Excellence in mechanical heart and lung support. He is a founding member of ECMONet and was founding research chair of the Asia-Pacific Extracorporeal Life Support Society.